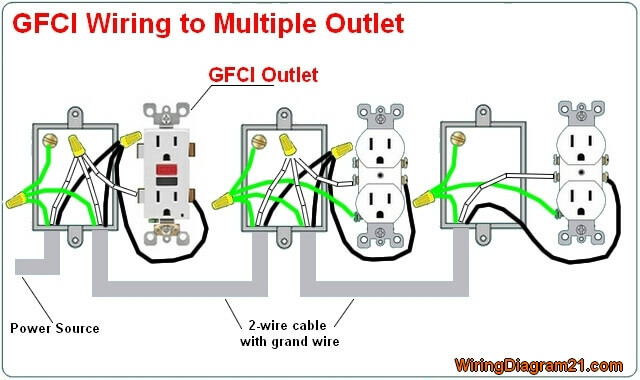 What is GFCI Outlet ? 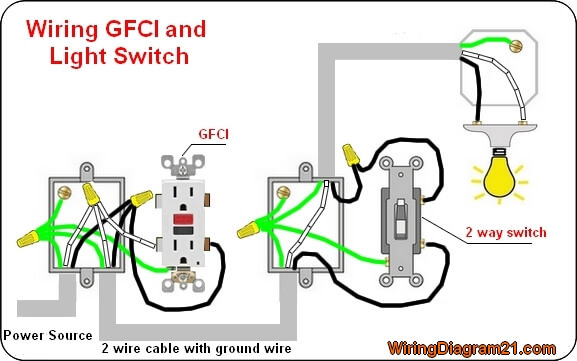 What is GFCI so it means “ground-fault circuit interrupter” which works mainly as to protect human or device also from connected to electric shock from electrical power. It is also called Residual Current Device (RCD) that shuts off an electrical power circuit detecting that undesirable path is following by electricity like through water or any living thing. Also we have to define GFCI from NEC as “a device or instrument as shown below works for protection of any connected personnel which disturb the function of electricity to some circuit or another device”. Ground Fault Circuit Interrupter GFCI is a device which secure person from electric shocks from faulty currents in the electrical devices we use in our daily lives. It works by comparing the input current on the ungrounded side (red-wire) to the output current on the neutral side (black-wire). This shows 2-wire 14 gauge cable with grand wire having supply of power supply and connected GFCI. So, the solid-state-circuitry opens the switching contacts and de-energizes the circuitry as shown in the figure2 also. This will happens when GFCI is in on-conditions and when it fails to work the switching contacts remain closed and the device still giving the power with zero protection as to us. So also dangerous when fails. While damages occurs from voltage sparks from lighting and other transients. SO there is a power supply supplying power to the circuit while black wires shows ground currents and white shows the non-grounded wires or called HOT wires. While green wires are for removing faulty currents to ground for device protection. 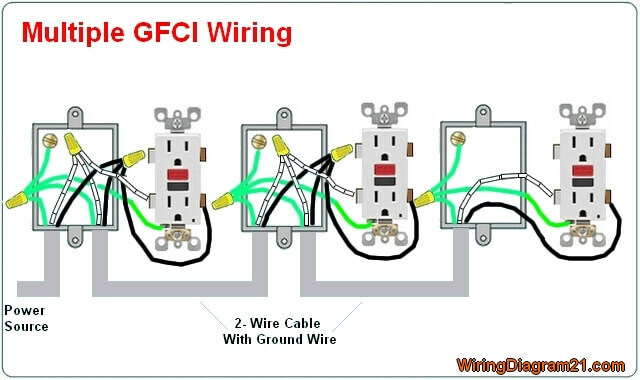 As 2-wire cable with ground connect to the other side of GFCI so connected both the protective sides of GFCI to the device for protection of both a device and a person using it from any circumstances and shock from electricity as shown above in the figure above. 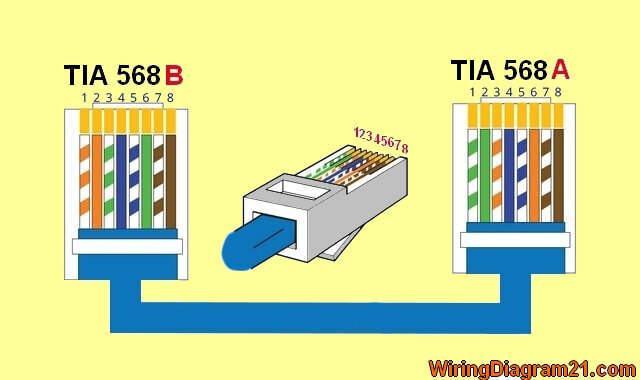 We have two types of wirings as single wiring as discussed above and another one is multiple GFCI wiring and we also attach the diagram to show how the wiring is done by designer or electrical engineer. We applied power supply either 230V/50Hz or 120V/60Hz where white is neutral and black is called “Hot” wire or calls non-grounded wire which connected to one terminal of GFCI while earthed-ground also shown in green wire which will protect our device from any non-relevant faults from power supply as given. GFCI is able to measure the fault current and sense the ground fault which is actually interrupted by GFCI. 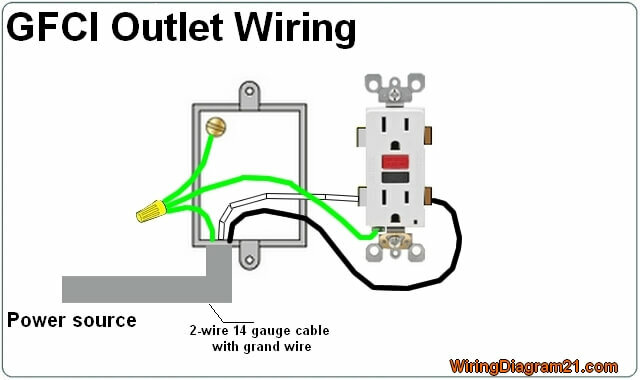 The above diagram shows the GFCI wiring to Multiple Outlet as in white while the pictures are same. One side of the GFCI connected to the ground (neutral wire as shown white in the diagram) and another side to the high potential (hot wire shown as black in the diagram) shows as in black color. The socket of GFCI indicates as one pair in each for protection of any circumstances because of any switching-impulse withstand voltage or any switching-impulse withstand voltage while the timing for short-duration power frequency withstand voltage is from zero to 60 seconds. Press the test feature of the GFCI protection device to ensure it works. These are excellent devices when properly wired. However, never assume a GFCI protection device is operational unless you test it. The good process is to check a GFCI is to use a circuit tester that has its own GFCI test button and plug in the tester and push its test button. If the power goes off, the GFCI is working. Press the reset button to restore power as shown in figure1 also. 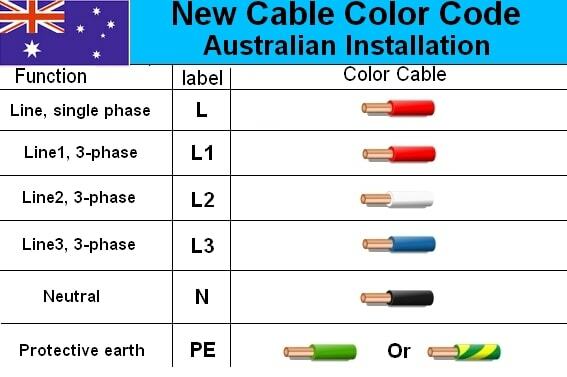 Look for a house Electrical wire color code guide: This article describes the new electrical cable color code wiring diagram ac and dc in United States,uk,Canada,Europe for single phase or three phase In Electrical engineering, different wires have different color codes. 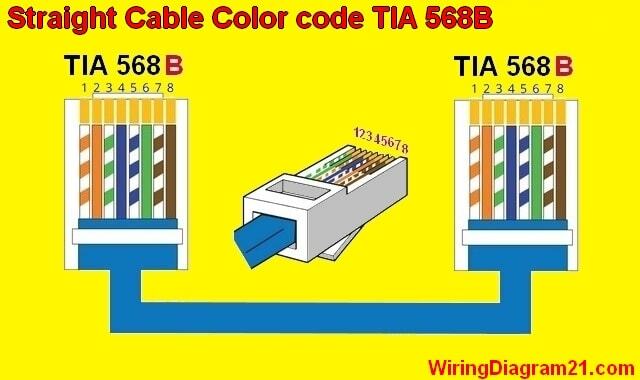 This makes it easy to differentiate and identify each wire .In diagram the live wire has a different color from the neutral wire and the earth wire. It is also useful for separating the three phases for three phase connections. And most importantly, it is good for safety purpose. The properties of one wire could be different from the properties of another and misplacing connections could be fatal to personnel handling the connections. The color coding convention in Europe is different from that of the United States, canada , united kingdom and australia. In Europe, the standard used is specified by the IEC (International Electrotechnical Commission). 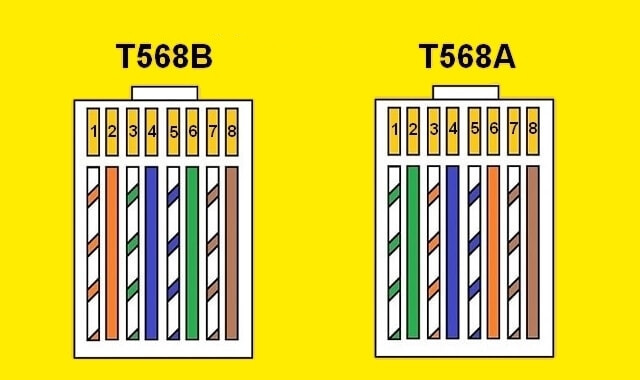 The wiring standard was initially published as IEC 60446 but in 2010, it was merged into IEC 60445. 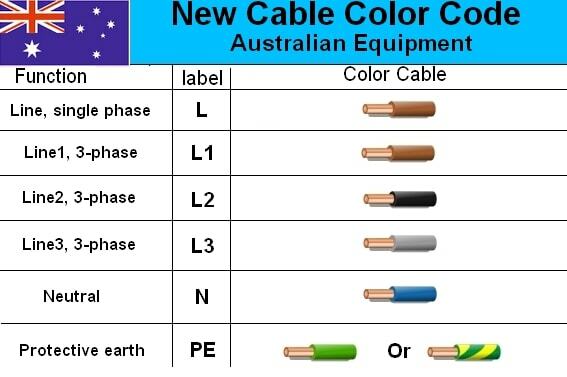 Striped green and yellow color for the earth/ground cable. Grey color is used for line 3. The new European color code takes account of proper phase rotation. The new standard was adopted to prevent people from confusing the protective earth wire with other electrical wires. It also protects people that have red-green color blindness. 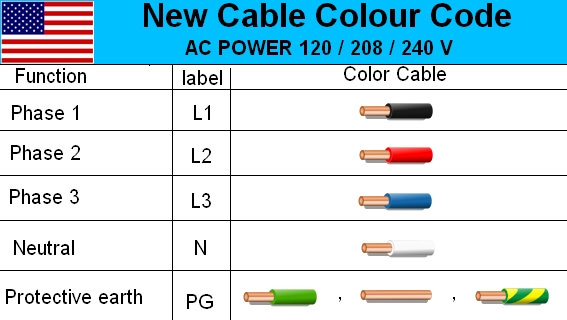 In the old IEC color code, all lines in the three-phase supply were black or brown and that caused so much confusion. 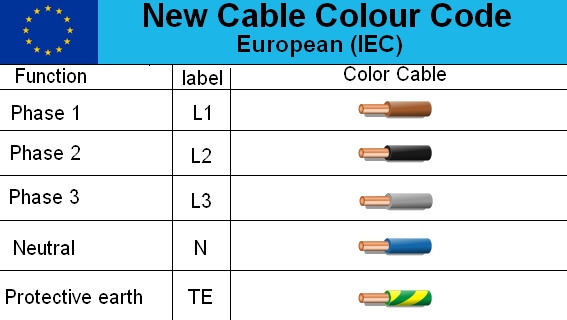 The United Kingdom now use the new IEC color code format. The United Kingdom used its own color code till 2004. 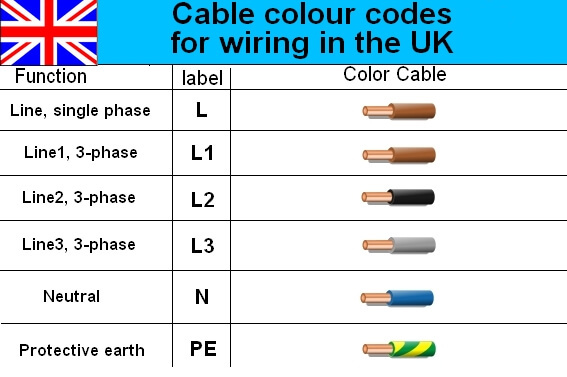 In March, 2004, the UK adopted the IEC color code. 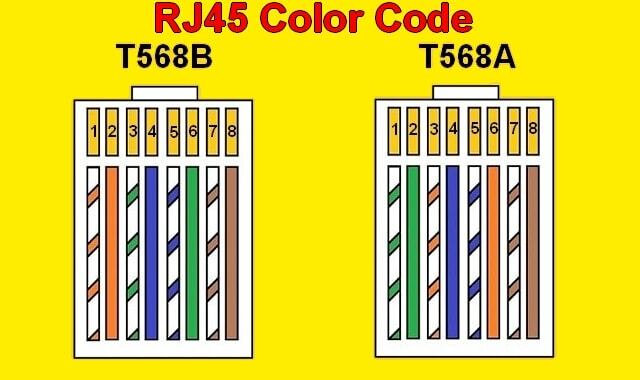 There are two color codes available in the United States for different voltages. 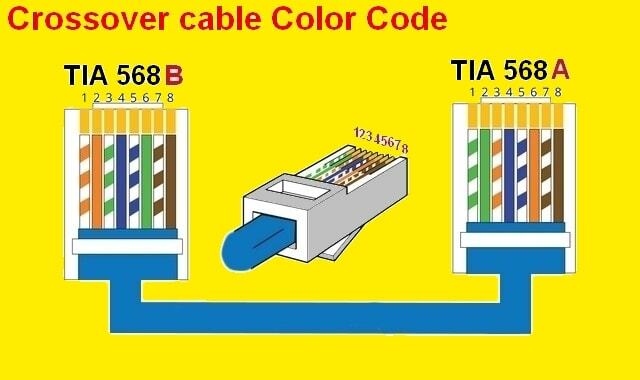 For 120/208/240 V single phase, the live cable is lack or red, the neutral cable is white colored while the protective earth can be green, bare or striped green and yellow in color. For three phase 120/208/240 V, the first phase is colored black, the second phase is colored red while the third phase is colored blue. 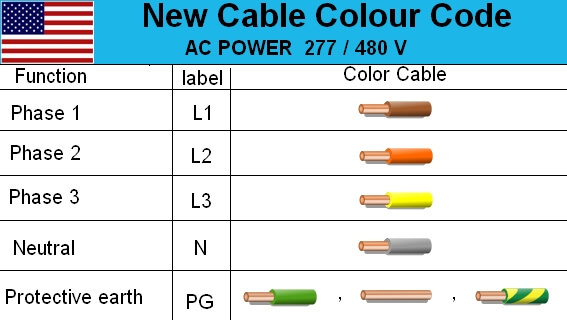 For 277/480 V AC power, the neutral power is colored gray while the earth is colored green, bare and striped green and yellow. The phase 1 is colored brown, phase 2 is colored orange, the phase 3 is colored yellow. The 277/480 V AC systems are usually used for industrial equipment and motors. The color code convention for each region should be followed. It will prevent electrical shocks due to wrong identification and inappropriate connections. 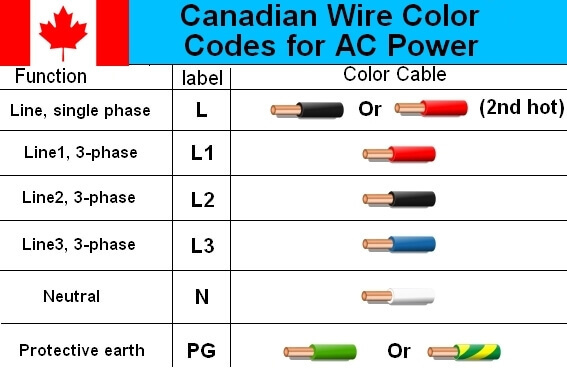 When you are faced with a tangle of wires and you need to do or repair some wiring, take note of the house electrical color coding wiring of that country. Green with Yellow Stripe for the earth/ground cable.